Crystal therapy or crystal healing is a form of vibrational medicine. Crystal therapy involves the application of crystals or gemstones to facilitate healing. Gemstones house spiritual and healing properties that can be tapped into a variety of ways. Crystals can be carried or worn on the person, or placed in a location where their healing vibrations can be felt. Each type of stone has its own unique talent. Gemstone colors, shapes, and textures all have special meanings. This is a powerful method of cleansing negative energy, clearing and balancing the chakras, effecting emotional release, and bringing light and healing into all the aura bodies. Cleared, programmed, and dedicated stones move the clients' vibration into alignment with the planet and the universal grid. This results in a freeing of life force energy in the chakras and aura, a healing of the Body of Light, and a transformation of negative or dis-ease into health. As Carol places the stones, she may be guided to use them alone or with different hands on healing such as Reiki, The Beishu Method or Holographic Healing. 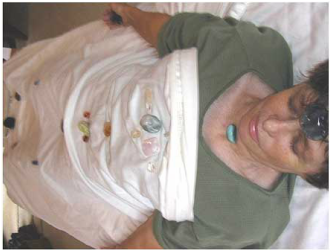 The stones are placed upon the client's body in one direction, either from feet to head, or head to feet. During this session, a clients guides often come in to assist in the healing process. Carol with then sit beside the client and simply wait, allowing the gemstones and spirit guides to do the healing. As the client's chakras and aura absorb and are balanced by the crystal and gem energies, the stones sometimes begin to roll off. A laying on of stones healing can be quite intense. There is often a major energy shift during this type of healing. More frequent emotional releases, past life and this life trauma openings and other transformational events. After a session, there may also be a physical detoxification process that can continue for up to a week. Be aware of what is happening and again, allow it. The changes are always positive and are usually gentle.